Damsan has an unusual, over the top exterior that is slightly off-putting. Average rating 7.4 from 223 reviews. However, the rooms are great for the price. The standard and superior have the same configuration except for the flooring – standard has tile while superior has laminate floors. Both rooms are spacious, get natural light and have a sitting area, box TV, fridge, bedside electrical plugs and table, minibar, kettle, air-con, WiFi and desk. The decor has been jazzed up with colourful lamps and tribal fabrics on seat cushions and the padded headboard. Bathrooms are boring and functional with the usual bathtub/shower combo and granite countertop. Breakfast is included in the rate, and there’s a large swimming pool and tennis court to boot. 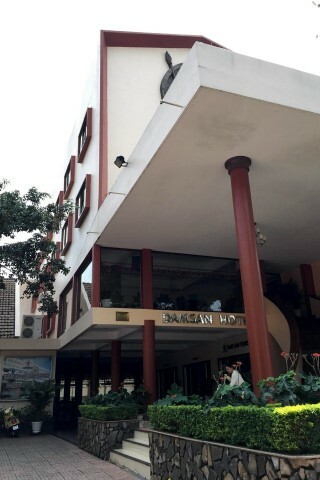 Damsan Hotel offers good value, something to weigh against being one kilometre away from the centre. Solo travellers receive 100,000 dong off the rate.